Your aquarium is supplied your aquarium is supplied with important trace elements and vital substances when you use Dennerle S7 Vitamix. Symptoms of nutrient deficiency - such as yellow and translucent leaves - will disappear. Vitamins, plant enzymes, and other organic agents are continually replenished in nature. Planted tanks lack exposure to sunlight and other natural sources of nutrients. That's why consistent feedings are vital. 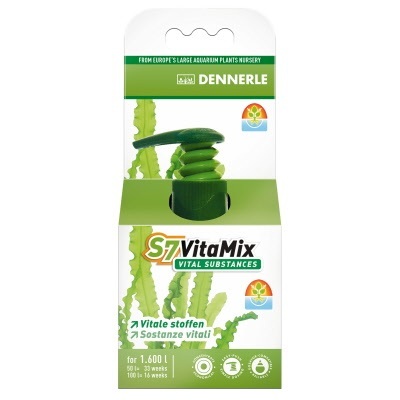 S7 VitaMix offers aquarium plants all the crucial vitamins and other essential substances. All lifeforms – from plants to fish to filter bacteria – require numerous minerals, trace elements, and other vital substances. These nutrients should be dispensed frequently to your tank since there are typically insufficient amounts in tap water.